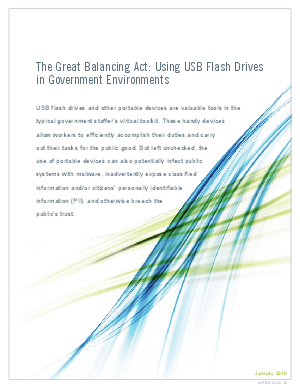 USB flash drives and other portable devices are valuable tools in the typical government staffer’s virtual toolkit. These handy devices allow workers to efficiently accomplish their duties and carry out their tasks for the public good. But left unchecked, the use of portable devices can also potentially infect public systems with malware, inadvertently expose classified information and/or citizens’ personally identifiable information (PII), and otherwise breach the public’s trust.